← Today is National Jewel Day! Have you updated your info on your Loyalty Card? Do you have a Loyalty Card and have recently changed your email address? We would like to keep you up to date on the latest sales, promotions and more, so please let us know what your current email is by contacting our Loyalty Department at: loyalty@jewelrywarehouse.com – Be sure and tell them what your registration name is when you signed up. If you do not have a Loyalty Card, you can sign up here for free! You will receive 2% back on every purchase! More information: By making purchases from the Jewelry Warehouse, Garnet and Black Traditions, Tiger Paw Traditions, and Palmetto Traditions (online or in store). You’ll earn 2% back on all purchases. Certain types of purchases may not be eligible for the Loyalty Rewards Program, and others may earn rewards at higher or lower rates than typical purchases. Jewelry Warehouse has complete details. Loyalty Rewards are earned at a rate of 2% of every purchase. So, if you purchase $100 worth of merchandise, you’ll receive $2 in rewards. 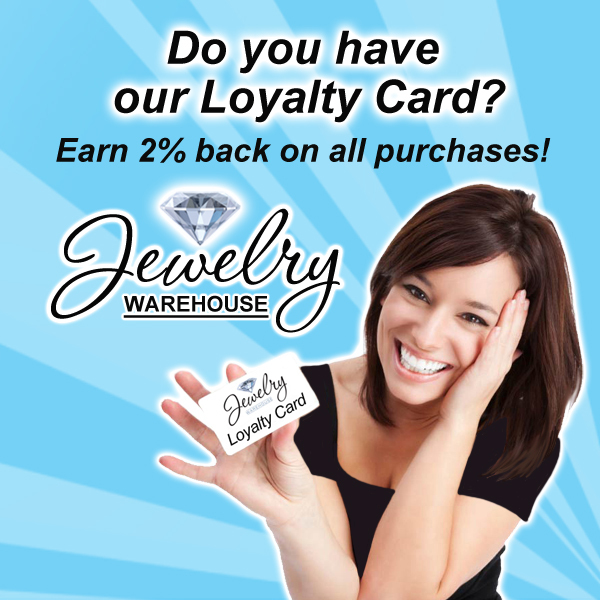 Rewards dollars you earn can be redeemed only at Jewelry Warehouse locations and on-line and cannot be transferred to another Loyalty Rewards account. In addition to your regular 2% back on all purchases, we’ll also offer special bonus Rewards items. These specials will be advertised via email or through local print and audio advertising. This entry was posted in Jewelry, Jewelry News, Jewelry Tips, Sales, Uncategorized and tagged Jewelry, jewelry warehouse, loyalty card. Bookmark the permalink.